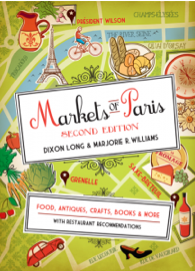 If you or your family or friends have a trip planned to Paris, you’ll want to purchase a copy of Markets of Paris Second Edition by Dixon Long and Marjorie Williams. First published in 2006, this paperback, with insider information on the legendary food, flea, antique, and other markets of France’s capital, has just been reissued with fabulous updates and additional information. Just the right size for travel, this petit livre with gorgeous photos, can easily be tucked into a purse, a tote, or a backpack. Organized by arrondissement, it’s also a snap to use. The authors lead you to Paris’ celebrated outdoor food markets and indoor food halls, guide you to the ever-popular antique and flea markets on both the Left and Right Banks, and even offer restaurant suggestions for culinary pauses during your shopping forays. You can order the book online here or stop by your local bookstore. 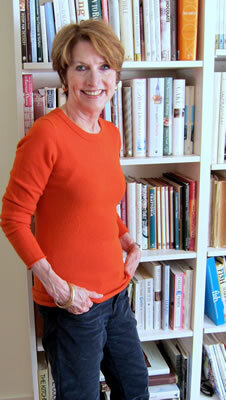 For more info, check out Marjorie Williams’ website (http://www.marjorierwilliams.com). This entry was posted in Book Review, In My Basket, Paris and tagged Dixon Long, Marjorie Williams, markets, Paris by brosbottom. Bookmark the permalink.